In the current economic climate we need all the help we can get in order to secure that new contract. Developing a professional portfolio is the first all-important step. While it's not entirely true that your work will sell itself (you're going to have to hone your elevator pitch too), your portfolio is your first contact with a prospective client, designer or architect, and it says a lot about who you are as a professional. So it makes sense to put your best foot forward. 1. Pick only your best samples, and make sure they are all neatly trimmed to uniform size. I back them with self-adhesive black flocked fabric, which makes them feel nice to the touch, and also adds protection from scratching. 2. Buy some sort of neat box to put them in. Samples tend to be bulky, so I don't put them in a classic portfolio case. I bought a plain wooden box - the kind available from most Arts & Crafts stores - then stained and polished it black. I recommend a sturdy box because once those samples are out of your hands, you want to be sure they are protected. I used to use a folder-type portfolio, but all my samples got bent and trashed by clients. Your samples are gold, so take care of them. Also; make sure to line the outside bottom of the box, because you do not want your portfolio scratching your client's table. I use the same self-adhesive flocked fabric as on the back of my samples. 3. Make a CD of your work, and print up a label that has all your contact info and 'please take one' written across it. I personally do not concern myself with the copyright issue of leaving unprotected images of my work. I'm more concerned that I leave as much varied collateral material for my client to remember me by. 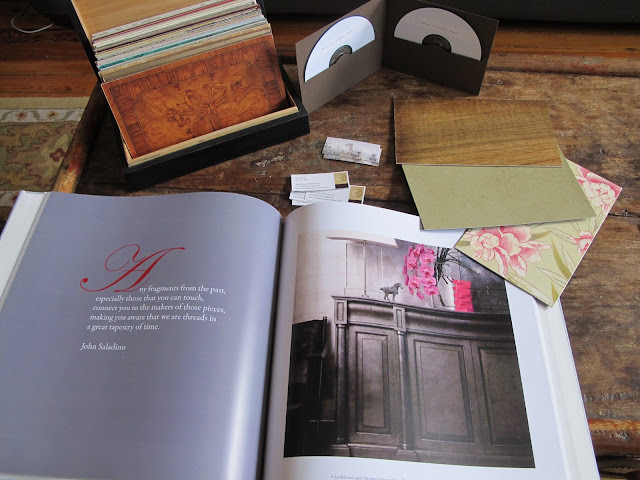 I bought a nice card stock CD holder and glued it to the inside front cover of my portfolio book. I also place some business cards in there too. 4. Get some nice business cards made. Moo cards does a fantastic double-sided waxy card that is small, but big enough to carry all the basic contact info. Don't forget to write what you do on the card; it's amazing how many people forget. I don't know how many times I've pulled a card out of my pocket with someone's name on it, but no indication of their profession. It goes straight in the trash. Make sure that you drop off plenty with your portfolio. 5. Blurb does a great hard-cover printed portfolio book. I used the 12" square format, and with about 100 pages it came out at around $100. Not cheap, but well worth the investment. Of course, you'll have to make sure that your photographs are of sufficient size and quality, but the prints from Blurb are pretty good. As you can see in the photo above, I threw in some quotes by famous designers to lend it a whiff of respectability. The Blurb software is easy to use, is MAC and PC compatible, and comes with a variety of handy templates that enable you to simply place your artwork before uploading it to their server for printing. They even have a storefront on their site where you can sell copies of your book. "There is something terribly morbid in the modern sympathy with pain. One should sympathize with the color, the beauty, the joy of life. The less said about life's sores the better. " I've spoken before about one of my golden rules: Never get out the small brush until you're done with the big one! Knowing when to whip out the #0000 brush and concentrate on details is an all important lesson we can learn by studying the Masters. 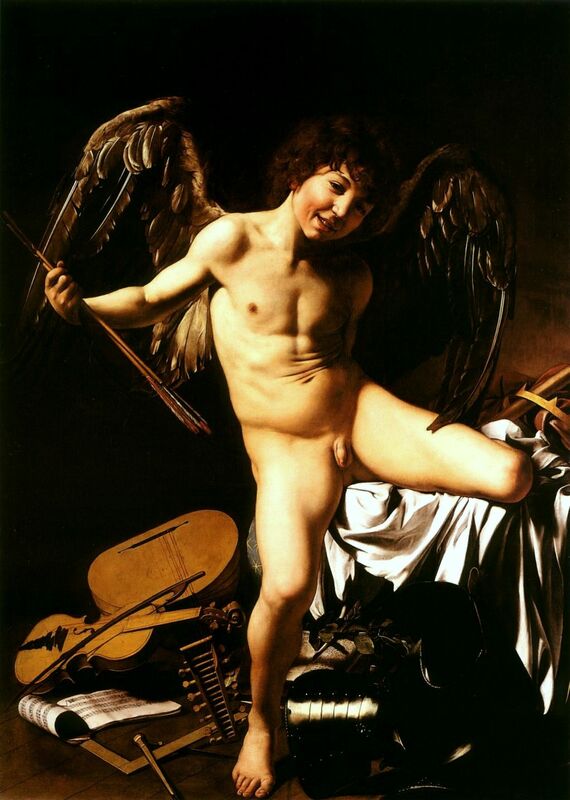 Caravaggio knew as well as anyone that he could leave large areas of his canvas almost completely devoid of detail as long as he threw in a painterly flourish here and there. Even a small area of fine detail is enough for our brains to read the entire painting as a fully finished and convincing representation of space. Consider the striking Amor Vincit Omnia, noted for it's realistic representation of Cupid and for it's "photographic clarity". It's worth concentrating for a moment on what that means in terms of the construction of the painting. The areas in red (above) have almost no detail at all, let alone fine detail. You could even include large areas of the rendered flesh in there too. Even a quick glance shows us that Caravaggio painted over 50% of the canvas with a big fat brush. Only the dark areas (highlighted above) were painted with his tiny brushes. Cupid's charmingly crooked teeth and the huge wings lent by the painter Orazio Gentileschi as props are among the very few areas that receive Caravaggio's closest attention. Less than 10% of the canvas, in fact. Yet the painting as a whole invoked huge acclaim for it's realism. That's good news! Think of how much time can be saved by learning this lesson. I had an opportunity to apply some of these techniques while working on a painting that was an homage to Caravaggio's theme of 'Love conquers All'. I know first hand just how long it takes to really focus on creating detail on such a precise level. I painted sheets of music that had been torn up and taped back together. The notes painted on these scraps took forever. I posted some details from the painting below. Besides the compositional merit of leaving plenty of breathing room in a painting, of not overwhelming it with tons of distracting detail, it's also a simple and practical matter for the professional painter whereby it's commercially unrealistic to spend massive amounts of hours on any one painting. It's not about cutting corners necessarily, but I do love finding ways of spending less time working. Thanks, Caravaggio! 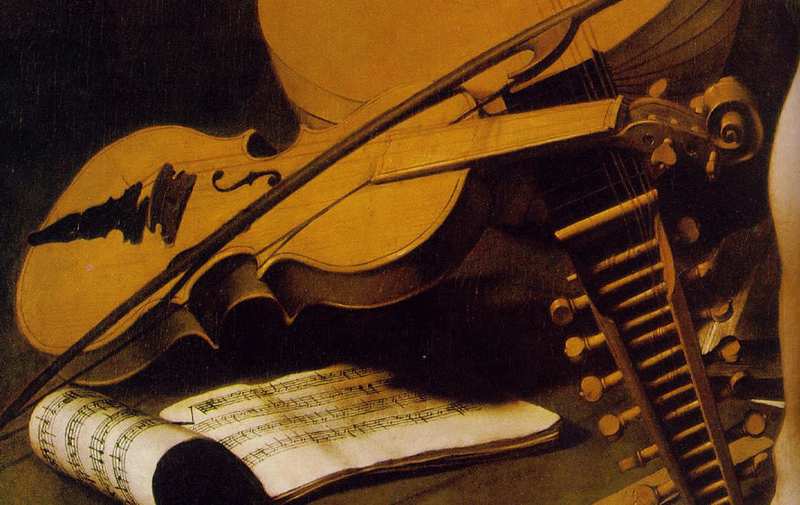 Let's examine that even further: I know from experience that it would take me at least one day to complete each of those areas of detail in the Caravaggio's painting (if I was bold enough to attempt a copy). There are roughly 10 areas of detail, and you value your time at $300 per day. Congratulations! By painting all that detail you've just added $3,000 worth of value to your new painting. What was that? The buyer isn't prepared to pay an extra $3,000 for your effort? Make no mistake: Somebody pays for all that effort. And if it's not the buyer, then it's you. I know I cannot paint faster than I already do, because I've tried it. I'm not fast by any means, but I know my limits. I realize that if I'm about to paint a small still life of some fruit, then I had better finish that painting in one day and no longer because the most I can get away with charging for a small painting like that is roughly the same as my day-rate. Duane Keiser does exactly that. Besides the marketing caché of 'a painting a day', it's also sound financially. If the most you can charge for a small painting is $300-$400, then you had better fine tune your technique so that you spend no more than a day painting it. It sounds harsh to break it down in terms of money, but if we want to make a living (and maybe even retire one day) then I believe that we have to be a little businesslike about Art production. I just figured out what I'll do for my Trompe l'Oeil painting class: The vase above, which I photographed outside the Vanderbilt mansion in Rhode Island. 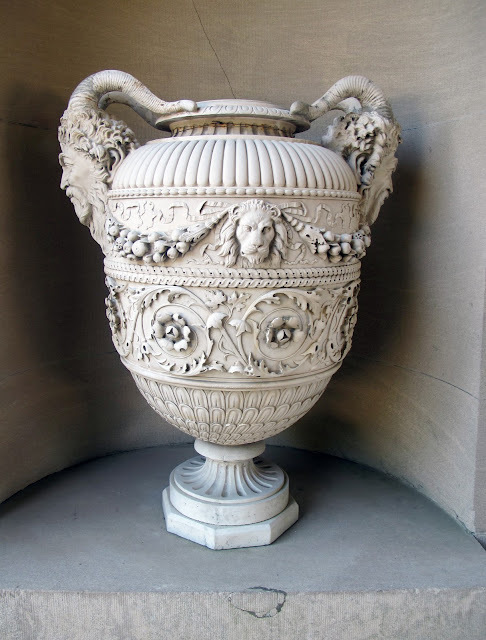 There's so much great detail going on within the vase itself that it's a perfect lesson in all the various forms of ornament, and grisaille painting. 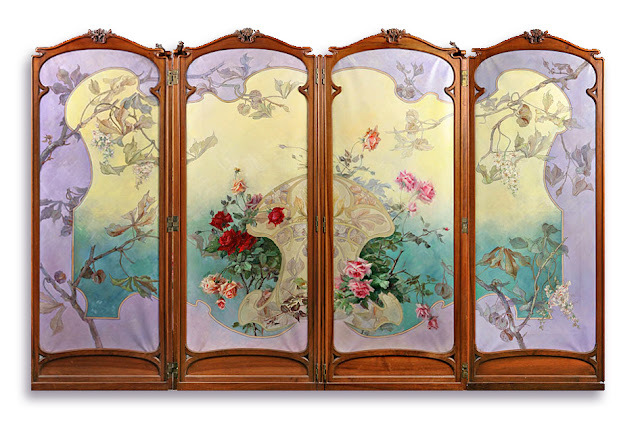 This photograph reminds me of the panel by De Lairesse which you've seen before on this blog. 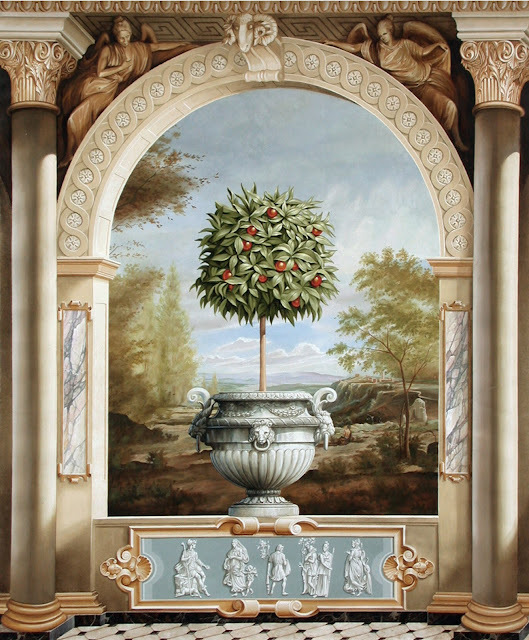 The balance of a large value range within the space of the vase, against the smaller value range of the rest of the niche is reminiscent of his trompe l'oeil masterpiece. It could be combined with an Italianate landscape in the background as in the photograph below. Or maybe just painted as it is, in shades of grey. I did something similar for the Kips Bay Show house in New York City in 2003, but I've always wanted to do a taller panel, with less stuff going on around the vase. I hadn't yet studied the De Lairesse piece and learned its lessons about value. Everything I painted in the panel below was treated with a similar range of values, and the result is a flattened painting with little sense of depth. It's a little unclear whether Andrea Palladio enjoyed seeing the interiors of his buildings decorated with paint, but who cares?! This is awesome! Just look at the cast shadows thrown from the beaded molding around the door frame. Absolutely spectacular examples of wall painting. The only thing that'd really rub old Palladio the wrong way would be the complete disregard for the architecture of the room. Zelotti's painted opening pays no attention whatsoever to the position of the actual door to the room. The trompe l'oeil columns just disappear into the door frame. It's as if Zelotti had a better idea as to where the door should have been placed than Palladio himself! 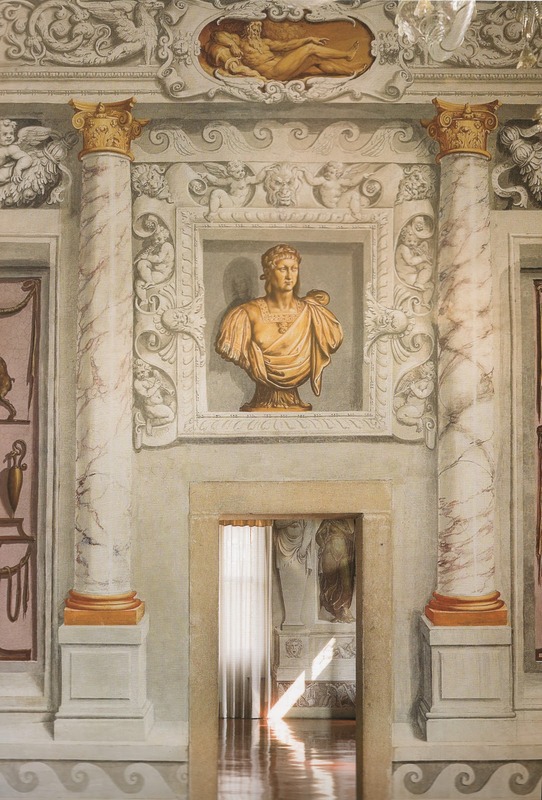 Giovanni Battista Zelotti added to the already overflowing decorations started by Gualtiero dell' Arzere in Villa Godi (Palladio's first villa), constructed in 1537. 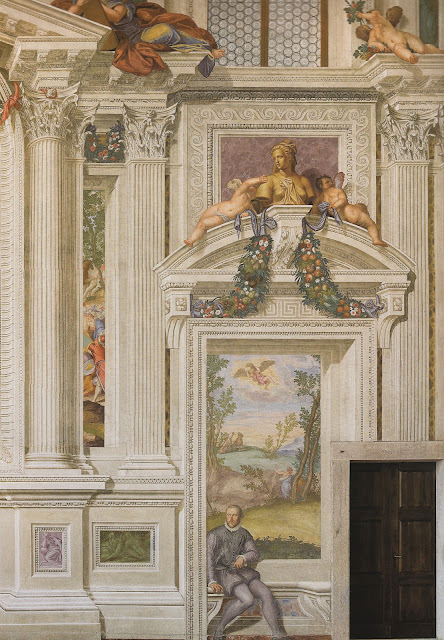 His trompe l'oeil in this, the large central salon, is more fluid and monumental than Gualtiero's, and takes on a popular theme of the time: the depiction of a human figure (presumed to be Palladio himself) in an opening or doorway. 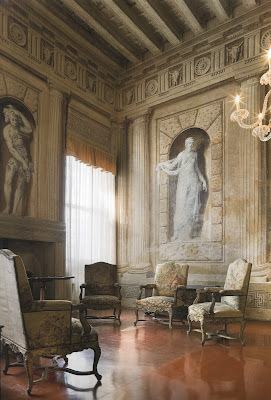 These images are from Volume II of Antiques in Italian Interiors, which came out in 2010 from Verbavolant books. Both volumes are an incredible treasure trove of gorgeous photographs by Mario Ciampi, of interest to anyone curious to see the painted decoration of Italian villas. Highly recommended. The painted dioramas in The Natural History Museum in New York City are some of the most outstanding examples of mural painting that I have ever seen. There is a palpable sense of place in these dioramas, such that the viewer feels instantly transported. The feeling is not unlike vertigo. Though the hand of the artist is distant, the sense of joy and awe they clearly felt is there in abundance. James Perry Wilson was one of a group of incredibly talented artists responsible for painting the dioramas. Yale Peabody Museum (for whom he also painted dioramas) presents an excellent and in depth study. The author says of him that "it is worth noting one of the differences between Wilson's plein air painting and his diorama work. 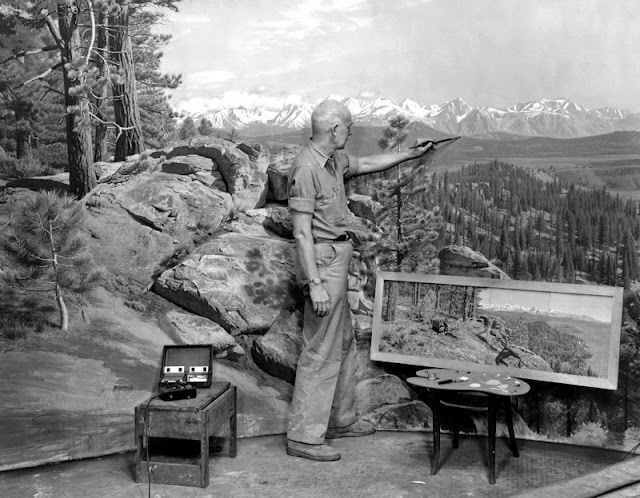 Accuracy was possibly more pronounced in Wilson's diorama work than in his plein air studies, but in both, he tried to paint himself out of the painting to allow the viewer to focus on the illusion of reality and not the artifice of its creation. Wilson sought to make the artist transparent." In fact, it takes close inspection to tell that there are different hands involved in the production of the paintings. Yet somehow they defy blandness of expression, and maintain a freshness that is still present many years after they were produced, despite aging and the damaging effects of ultra-violet light. "Wilson's paintings have a clarity and lack of muddiness that would have been impossible to achieve had he fussed over mistakes, over-painted, or made numerous changes." Imagine my sitting there on a ladder in the middle of a wildlife setting listening to [Charles] Chapman and William R. Leigh debate points of perspective, with Belmore Brown finally coming over from where he had been working to tell them they were both nuts-then Brown giving his own views on the matter in eloquent style...."
"The full backdrop was often 35 feet wide or more, with a dome-shaped ceiling. This required large amounts of paint and careful mixtures. To make the perspective accurate across such a oddly curving surface, Wilson worked out a unique grid system that he called “the unsquare square” to compensate the foreshortening of the side sections. Every backdrop was carefully planned using maquettes, color sketches, and full-size charcoals drawn on the backdrop before the final paint was applied." These artists were dedicated professionals and all went to extraordinary lengths to create their work. Carl Akeley (along with William R. Leigh) famously made an expedition to the Congo in 1924 to research the landscape for the Gorilla diorama, and wrote a book detailing his experience, called In Brightest Africa, available for free download. They were dangerous and physically taxing journeys into the blankest sections of the map, pith helmets and pistols in hand. In fact, Carl Akeley died on the Eastman-Pomeroy expedition to Africa in 1926, underscoring the demanding nature of the work. James L. Clark, the man responsible for building the diorama halls, had a number of close scrapes himself, on one occasion falling ten feet into an elephant trap and miraculously missing sharp, poisoned bamboo stakes on the way down. He and Akeley, in a fit of impetuousness driven by boredom, once decided to ignore warnings of "hostile natives with poisoned arrows" to climb Mount Elgon (14,176'). I posted a large set of photographs of the dioramas on my Flickr page.